Use Mailchimp Pro's Comparative Reports feature to assess the performance of multiple campaigns over time. Schedule and share reports, and add subscriber segments to get a better idea of how different sets of subscribers interact with your campaigns. This feature is included with Mailchimp Pro, which is available to add on to any pricing plan. In this article, you'll learn how to create a Comparative Report. Be sure you're familiar with Comparative Reports. Comparative Reports are only available to account Owners, Admins, and Managers. Learn more about user permission levels. To complete this process, you will select a list from your account, choose which sent campaigns you want to compare, and finalize your report. Comparative Reports can include data from sent Regular and RSS campaigns. To create a Comparative Report, follow these steps. Click Rename Report in the upper-right corner. In the pop-up modal, type your report name, and click Save Report Name. Click the List drop-down menu and choose the list you want to use for your report. After you select a list, its sent campaigns appear on the right side of the screen. Use the filters to choose which campaigns to compare. 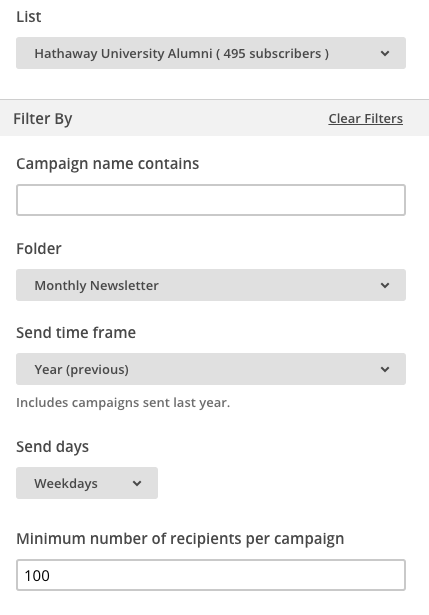 As you select filters, we'll display the sent campaigns that match your criteria. To clear your filters, click Clear Filters. Your report will update to include future campaigns sent to your list if they match the filters you set for the report. Review the campaigns selected based on the filters you used. Campaigns are selected by default, and display a blue checkmark in the upper-right corner. To deselect or reselect an individual campaign, click the name of the campaign. You also have the option to click Select All or Deselect All at the top of the campaign results. Click Compare Campaigns to run your Comparative Report. We'll generate your report in the background and notify you in your Profile menu when we're done, so you can work elsewhere in your account. You have the option to add segments to your report while your results generate. Your report will be saved on the Comparative tab on the Reports page in your account. We'll display a status icon to let you know your results are generating. When your results are ready, you can generate your first Snapshot. 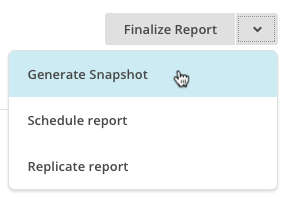 A Snapshot is the final report that's generated each time you run your Comparative Report. It shows you how your campaigns have performed up to that point in time. To generate the first Snapshot for your report, follow these steps. Navigate to the Reports page and click the Comparative tab. Click the drop-down menu for the report you want to work with, and choose Generate Snapshot. It may take a moment for your Snapshot to generate on the Report History page, where we'll store all the Snapshots for your report. When your Snapshot is finished, click View Snapshot. You can visit the Report History page at any time to view the Snapshots for your report. Mailchimp Pro's Comparative Reports let you see how campaigns perform over time. Uncover patterns and find ways to improve your next campaign.